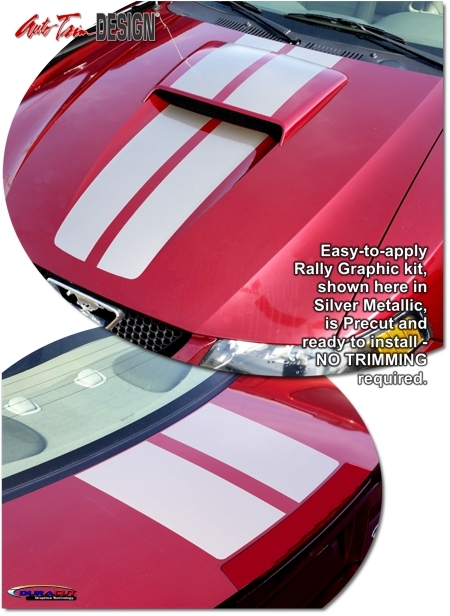 Make your '99-'04 Ford Mustang "Tough-looking" with this 40th Anniversary style Hood and Rear Deck Lid Rally Stripe Graphic kit. They're PRECUT and ready to install in a wide variety of colors - with NO TRIMMING required! Stripe package is not just a box of straight strips. Our graphic kit consists of prefitted and contoured pieces as shown in the illustration and will not fit any other vehicle. Optional Roof and Rear Spoiler kits available. Trimmable two (2) piece Spoiler Kit (ATD-FRDMSTNGGRPH415) includes two (2) 16" (40.64cm) long pieces that may be hand trimmed for custom spoiler applications.